MainAll NewsInside IsraelWho Will the New French Immigrants Vote For? Who Will the New French Immigrants Vote For? Parties including Likud, Labor and Yachad approach 10,000 new French Israeli voters and try to respond to their needs. Israelis awaiting their second general election in two years may be wearied by aggressive voting campaigns, but candidates in next week's snap ballot have found a brand new target demographic. More than 10,000 French Jews have moved to Israel since the 2013 election, and polls on March 17 come after parliamentary hopefuls have directly canvassed support among French voters, reports AFP. Prime Minister Binyamin Netanyahu encouraged French Jews to move to Israel in the wake of January's Paris terrorist attacks that left 17 dead, including four Jews at a kosher supermarket. He repeated the call for European Jews to return home to Israel last month after a terrorist attack on Copnehagen's main synagogue. "Netanyahu understands the importance of the French community in Israel and wants to reach out to them," Benjamin Lachkar, the French spokesman for the premier's Likud party, told AFP. Likud and its rivals have both seen the potential rewards in courting French-Israeli voters, not only for this election but also for future votes. The numbers are encouraging. Around 500,000 Jews live in France - the largest Jewish population in Europe and the third-largest in the world, after Israel and the United States. More than 7,000 French Jews arrived in 2014, doubling the previous year's arrivals, according to figures provided by the Jewish Agency for Israel. 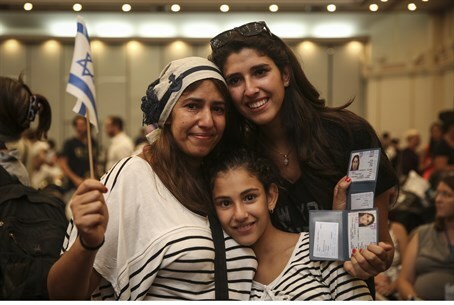 Last year, for the first time, more Jews came to live in Israel from France than from anywhere else, and a further 15,000 are expected to arrive in 2015 alone. "If the state of Israel can properly integrate its immigrants, then more will follow," said Yoni Chetboun of Yachad - Ha'am Itanu. Polls predict Yachad could win four to five seats out of 120 next week, and the party has held electoral meetings with French voters across the country in the run-up to voting. Chetboun, who himself was born in France, said he wanted the government "to solve the problems of immigrants coming from France," who face the same shortage in housing and social provisions as other newcomers to Israel. The majority of French Jews who have returned to Israel in recent years are said to be religious and lean to the right politically. As many as 50,000 may be eligible to vote next week, from a total electorate of about 5.8 million. Apparently fearful that the new arrivals will support parties farther to the right than Likud, Netanyahu's party has launched a social media campaign to lure French voters, including a French-language Facebook page. "(Only) Netanyahu can find the solutions to the problems of new immigrants from France," Knesset speaker Yuli Edelstein recently told attendees at a rally organized for French speakers in Jerusalem. The leader of the leftist Labor party Yitzhak Herzog and his running mate Tzipi Livni both affirmed their "commitment" to France and its Jewish population during a recent meeting in Tel Aviv, likewise courting the French vote. Livni, who is rumored to have worked for a stint with the Mossad in Paris during the 1980s, declared herself "moved each time she met a French person." Herzog, part of the Zionist Camp formed together with Livni's Hatnua and seen as Netanyahu's main rival this vote, said that his great-grandfather was a rabbi in Paris at the start of the 20th Century. "The Jews coming from France want social justice, politics that inspire peace in the region and a balanced state that is both Jewish and democratic," he claimed to French voters. "We are the only alternative to Netanyahu and we can meet your expectations." Herzog has openly said his plan is to divide Jerusalem and give the Palestinian Authority (PA) a state in the Biblical heartland of Israel.